Listeria spp. 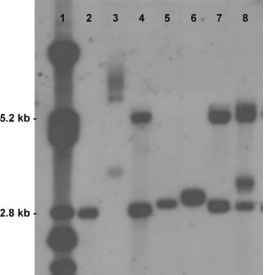 are facultatively anaerobic, nonspore-forming rod-shaped bacteria which belong to the grampositive bacteria with a low G+C DNA content. The genus Listeria comprises six species: Listeria monocytogenes, Listeria ivanovii, Listeria seeligeri, Listeria innocua, Listeria welshimeri, and Listeria grayi. All of these species are widespread in the environment, but only L. monocytogenes is considered as a significant human and animal pathogen. Besides L. monocytogenes, however, occasional human infections because of L. ivanovii and L. seeligeri have also been reported. L. ivanovii is nevertheless mainly responsible for abortion in sheep. The identification of Listeria species has long been hampered by small number of tests allowing the differentiation between these closely related species. Hemolysis, a major characteristic for Listeria species identification, may, in some cases (and especially for environmental and food isolates), be difficult to read on blood agar and tests monitoring the acid production from carbohydrates are time-consuming. In last years, the necessity to rapidly identify Listeria spp. has nevertheless led to the development of some new methods, including commercial methods. All rapid commercial methods need a selective enrichment step before the application of the assay. Some of them use an immunocapture step with antibodies specific to Listeria genus or L. monocytogenes bound to solid matrices; others are based on the unique characteristics of the DNA molecules. Herein and in the next entry, we will focus on molecular techniques based on the DNA molecule, which, unlike identification techniques based on phenotypic characters, are uninfluenced by environmental growth conditions and protein expression mechanisms. child. Despite the low incidence of listeriosis (2-15 people per 100,000 people per year), the disease is associated with high mortality rates (20-30%). [1-3] At first sight, this is difficult to understand because Listeria strains are, in general, susceptible to a wide range of antibiotics. Unfortunately, most antibiotics are not bactericidal for Listeria. Furthermore, the efficacy of therapy is limited by the fact of intracellular habitat of pathogenic Listeria. The clinical experience shows that the combination of amoxicillin and gentamicin is the best therapeutic option for listeriosis (for a review, see Ref. ).